In fact, the same error as the macpup529 at: Hungarian language can not be changed. All previous versions Macpup, and many puplet worked is all very well. The localization process worked for each one. These are not. in console should pup the GUI to select Language. Billtoo the difference in the devx files are just that ours have the stuff for e17 and EFL other than that they are the same. Karl Godt: in console should pup the GUI to select Language. The menu could be transferred to the Hungarian language. It is NOT ENOUGH for the first keyboard settings! Systematically everything should be changed! Does it work for you too ? /usr/sbin/quicksetup is the complete locale gui at firstboot . The problem is more complicated than I wrote. After transformation with the original surfaces E17 (Hungary) settings are lost. As for the good news: it seems that this method is safe. I think it may be bug in E17? Yeah its a BUG in e17. It runs the external setxkbmap command forcing a default us-keymap all the time it gets started or restarted (look into /tmp/xerrs.log) . The Keyzboard-Fixxer pet ↓ works fine. I'm testing the localization with the official Puppy langpack for Spanish language (compatible with Puppy 5.3~5.7.1). Of course as things are organized a bit different in Macpup, most of the menu and some apps are still in English. What is the shutdown manager used in Macpup? Where are its scripts located? At best I hope to gettext a few things and build a macpup_langpack model so that many more languages can be done in a more permanet basis. Note that Barry Kauler's internationalization support extends langpacks for compatibility across releases - before 2012 separate langpacks for individual releases had to be done. In that time developers didn't build upon internationalized scripts, they just kept on using the defaults, meaning that for every new release all the scripts had to be entirely gettexted and translated from the beginning. Because of this many people stop contributing. That's the main reason why there isn't a more complete langpack for Portuguese and Italian. vicmz, nice to hear that it worked for you ! The app is called /usr/sbin/plogout , it is a script, but not a common shell one . New to me is that there is also /usr/sbin/plogoutE and /usr/sbin/plogoutJWM . Posted: Sun 25 Aug 2013, 22:44 Post subject: Re: Hooray ! FINALLY! my favorite puppy with a French keyboard! Runtt, thank you from me, too (Spanish keyboard). Of course, I read the topic, before started working. Only always Restart X-server solve the problem. After settings, normal use, do not need to poke on E17. A little more info on the Keyzboardfixxer.pet. It works like an app. 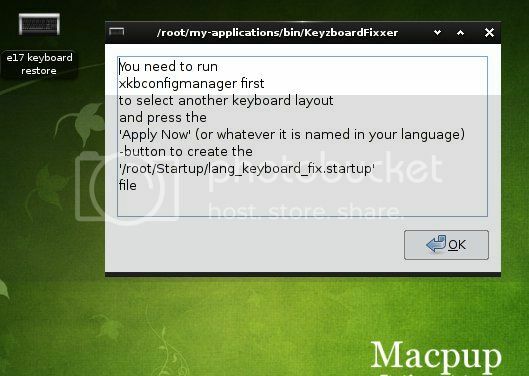 You can access from the menu under applications-Desktop -e17 keyboard restore. You can also add it to the desktop or put it on the ibar or favs menu or whatever. If you haven't set up your keyboard yet it will help you do it and if you have it will restore it when it gets mess up. And the thanks should go to Karl, he is the one who fixed it. Today was a good day 550 is getting it done !!! Yeah, Macpup was steaming along in the 90s, just about to drop out of the top 100 . You should release some experimental Macpups based on Slacko once a while . Personally I think the fact that we stayed on the chart without releasing anything for a whole year is one of the most impressive thing our little project has done. 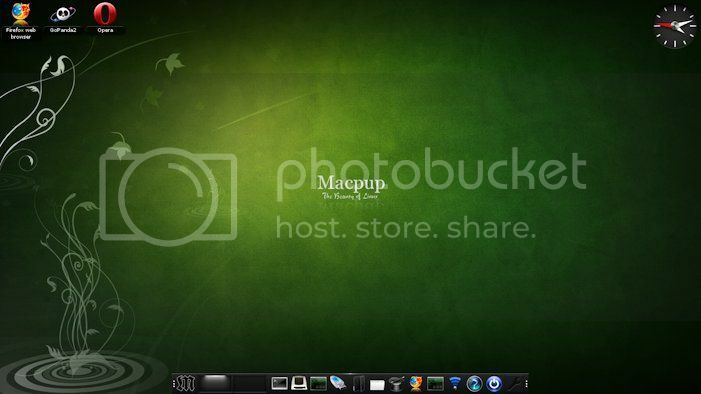 I don't know bout a slacko build.I am just not into slackware. I'm not saying anything bad about it . It doesn't really interest me. Some of the stuff I want to do with the next pup is of course fix the keyboard stuff but I want to improve our built in support. Changing a few things with the help pages. Going back to a unified look through the whole pup. I got burned using a matching gtk theme back with Fox 2 . But now that we have tester that can check stuff I think we can get away with it. PPM still need work.....stuff like that. But we are just three days into this release !!!! !